I've been back in Boston for a few days now, after some time at home in Western Mass, Connecticut, and a quick trip to New York City. Vacation was fabulous. I definitely recharged my batteries and I'm excited to jump back into the routine!! In addition to all the rest, travel, and food - I also was lucky enough to receive some foodie products for Christmas presents!! This is a staple in my parents' refrigerator. It is excellent on its own, but we like it best inside a panini with prosciutto and provolone. It is also great on a platter of cheese and crackers. It makes a nice sweet contrast with the salty cheese or meat. It's also pretty expensive, so it was a treat to receive on Christmas morning!!! 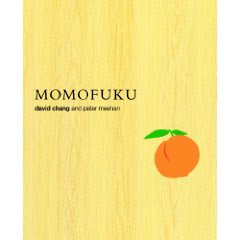 This cookbook by David Chang and Peter Meehan is primarily based on the recipes of the famous restaurants "Noodle Bar", "Ssam Bar", and "Ko". The recipes sound amazing, though challenging! I'm looking forward to wrapping my head around a couple in 2010. In addition to the book, Rafe's mom gave me another gift that might be one of my favorites in recent memory....As many of you know, I live in a teeny tiny studio apartment in downtown Boston. I have one little window, and no yard. I've always wanted to grow my own herbs and vegetables, but my lack of space and sunlight makes it fairly difficult. Enter, the Aerogarden! Here is the unit sitting on a shelf in my apartment. It is made up of a (very bright) lamp. And a base that holds the seeds of up to 3 plants. The aero garden came with some herb seeds and on Saturday I planted chives, thyme, and genovese basil. As of tonight (Monday night) I already have a couple little sprouts! Boy that was quick! It's so exciting to watch these grow. I can't wait to cook with fresh herbs in the dead of winter. I feel like I'm outsmarting mother nature. However, I did receive one foodie gift that satisfied my need for instant gratification!! My cousin Rita is one of my family members that reads the blog all the time (Hi Rita!!). Following my post on Puff Pastry Pinwheels Rita sent me a quick and easy recipe for Rollo Treats. They sounded delicious - but with all the craziness surrounding the holiday, I never got a chance to try them! Imagine my delight on Christmas when Rita arrived at my parents' house toting a box (a cute box with a dancing penguin) full of these addictive treats! Try these for yourself - but be prepared to share them! The combination of sweet and salty makes these hard to resist. They are very easy, and delicious! Spray a cookie sheet with Pam. Preheat Oven to 350. Place small twisted pretzels on cookie sheet. Place a rollo candy on top of each pretzel. Bake for 5 minutes. Remove from oven and immediately press a pecan on each rollo treat. The salt and crunch of the pretzels combined with the creaminess and sweet of the candy - and the richness of the nut...oh man these are outrageous! Hope everyone is having a great New Year!! What are some foodie gifts that you received - or are on your wishlists? Hello! Thanks for visiting my blog! I love yours, you have some great ideas (the pretzel rollo treats just might be my favorite snack on the planet BTW). Please, add me to your list and I hope you don't mind if I add you to mine! AH! I got the areogarden for Christmas too!! SO great! I had the chia herb garden last year, but that needed too much sun for my apartment! Happy "Gardening"!! Thanks so much! I'm looking forward to reading more from you, and I would be delighted if you added me! Kim - How cool is this thing??!! I can't help running into my apartment to look at my sprouts the moment I come home from work! So glad to know you're reading!! Did you have a good holiday and new year? Ha ha. We made those and added them to our Christmas cookie trays. My little sister loves making them. They are sooo good. I'm so jealous that you got Momofuku and an Aerogarden. I can't wait to hear about the recipes in the cookbook and how you use all those wonderful herbs! I just got an Aeorgarden! I'm freaking out about having herbs in the dead of winter! I will let you know how it goes. I'm like a kid at the mailbox bugging my doorman every day for packages! The Ko book sounds very intimidating to me. So I can't wait to read the posts!